Select your preferred shape and colour from variation menu. Best Way to Apply Make up - Best Sellers - Best Brand UK Seller To use whilst applying makeup such as structures etc, with a soft, simple grip design this makeup mixer sponge will give you the prefect surface. The hydrophilic Original Teardrop Beauty Makeup Blender ® is a made with an environmental friendly product, very soft to skin touch, at the same time breathable too. This Original Teardrop Beauty Makeup Blender ® is ideal for expert Salons, makeup artists, or daily home use. Makeup Sponge Blender is latex free, non-allergenic and odor free. Take it with you on your day-to-day travels and Washable too. Great for everyone and all ages. Ways to Use: Can be utilized wet or dry (When Beauty Makeup Blender is damp it is normal for it to expand slightly in size) Each sponge has its unique edge so you can choose which sponge matches you. 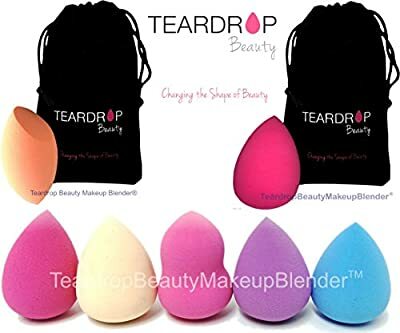 Wash lightly after use and location the Teardrop Beauty Makeup Blender ® in a cool dry location. Exactly what you will receive: Select your preferred shape and colour from variation menu which exactly what we will ship.